Open up any children’s book on dinosaurs and what do you see on the very first line of the first page? “Millions of years ago,” right? But have you ever stopped to think that if God created all of the life on the planet including the dinosaurs, then why doesn’t it say, “In the beginning God?” Could it be that someone is hiding the truth from us? Could it be that we’re being brainwashed with an evolutionary lie about dinosaurs so we’ll never discover the Biblical truth about God? The answer is simply, yes. And that’s why this series, The Truth About Dinosaurs, not only shows you the true history of dinosaurs, but it also shows you the true lesson of dinosaurs. That God is real and we really need to have a fear of Him and get right with Him before it’s too late. 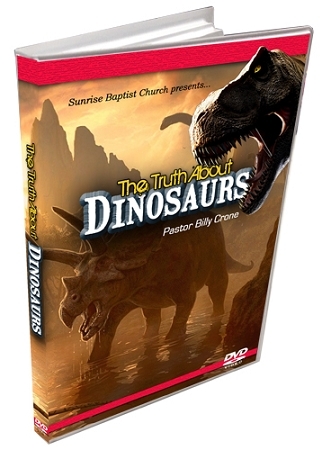 In this study you will see such amazing evidence that answers such thought provoking questions as, “Does the Bible Mention Dinosaurs?” “Did Man Coexist with Dinosaurs?” “Did a Flood Destroy the Dinosaurs?” “Did the Dinosaurs Get On and Off the Ark?” “Do Dinosaurs Still Live Today?” and finally, “Did Man Really Walk with Dinosaurs?” Please, don’t let yourself be lied to any longer. Dinosaurs not only came from God, but they show us we need to fear and get right with God before it’s too late. Won’t you let one of His most awesome and Fearful Creations ever, the dinosaur, lead you into a beautiful intimate personal relationship with Him? That’s the true lesson of dinosaurs! Discover the truth for yourself!